We want you to be satisfied. HP ProLiant DL DL380p G8. 2x Intel Xeon E5-2620 - 2.00GHz 6 Core. 8 drive bays, blanks not included. 1 PCIe 3.0 X16 X16 7 Full Length, Full Height Slot 2 PCIe 3.0 X8 X8 10 Half Length, Full Height Slot 3 PCIe 2.0 X4 X8 1. Redundant Hot Plug Power Supplies - Power Cords Not Included. 8x 2.5 SAS/SATA Drive Bays. Onboard Dual Gigabit - 4 Ports Total. Embedded ATI ES1000 with 64MB SDRAM. Integrated ILO 4 Controller (License Not Included). Software Media or Licenses Not Included. Several - Available Upon Request. 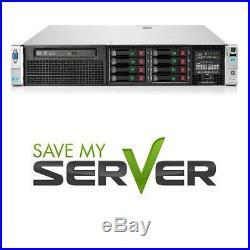 In those instances, SaveMyServer recognizes the continued need for proper disposal. Whatever we cant use, we recycle. SaveMyServer Item Information: 10DM - Brandon - 18794 qid: 29586. The item "HP Proliant DL380p G8 Server 2.00GHz 12 Cores 64GB RAM ILO PSU" is in sale since Wednesday, January 10, 2018. This item is in the category "Computers/Tablets & Networking\Enterprise Networking, Servers\Servers, Clients & Terminals\Computer Servers".